Charles Tomasch, friends and his Redskins van. 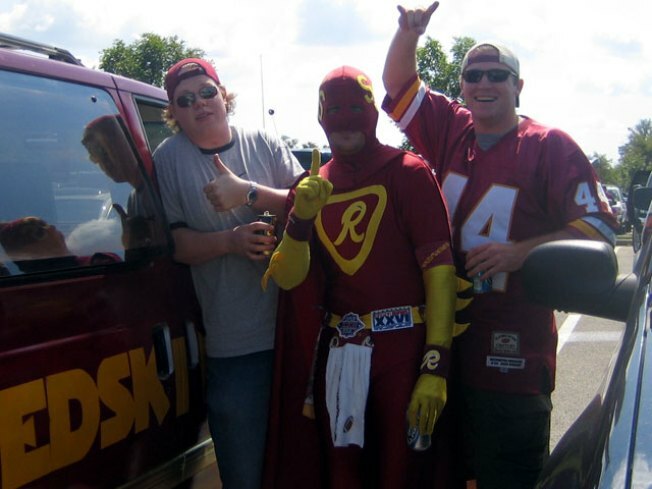 The "Redskins Van" was a staple at FedEx Field tailgating for years. With a fire truck siren blaring and plenty of food and drinks to go around, the burgundy and gold party vehicle was the pinnacle of Charles Tomasch's game-day festivities. But the "Redskins Van," like its namesake's Super Bowl dreams, is no more. Tomasch ditched the van in the Cash for Clunkers program. Hey, you gotta make up for the money lost on Redskins season tickets, right? Tomasch describes himself as a lifelong Redskins fan. He grew up in the Annandale area and currently lives in Falls Church, and he was a Redskins season ticket holder until two years ago. He's slowly seen himself transform from a Redskins fan to a Dan Snyder opponent. And after watching the team suffer a total collapse this season, he and his brother have had enough. "We've just seen a decline since they moved to FedEx, and then it's gone down from there," Tomasch said. "My brother said, 'What if we put up something jus to show Dan Snyder just how discouraged we are with the way the team has gone?'" And from that idea came the Web site sellourteamdannyboy.com. Tomasch and his friends want to raise $8,250 -- not to buy the team from Snyder, but to buy ads on Metrobuses that would be seen across the city. The goal: Get Snyder to sell the team, or at least leave the team alone. "They have a team here where Snyder claims to be a Redskins fan, but it seems like they take advantage of us," Tomasch said. "We can't force him to sell it, but we at least want to let him know that we are upset and feel taken advantage of." What will his $8,250 buy him (besides peace of mind)? "It seemed like a waste to spend all that money on a football team," Tomasch said. So Tomasch and his friends will be out canvassing FedEx Field before Monday night's game against the Eagles to drum up support for their cause -- at least until Snyder's security force tells them to stop. But Tomasch said he hopes the Skins will allow their protest, because deep down inside, they're still Redskins fans, and probably will be no matter what. And if an Eagles fan tries to get them to switch allegiances at the game? No dice. "I would just give up football before trading to another team," Tomasch said. "Especially the Eagles."